This is the first time I tried this combination and it turned out so delicious. 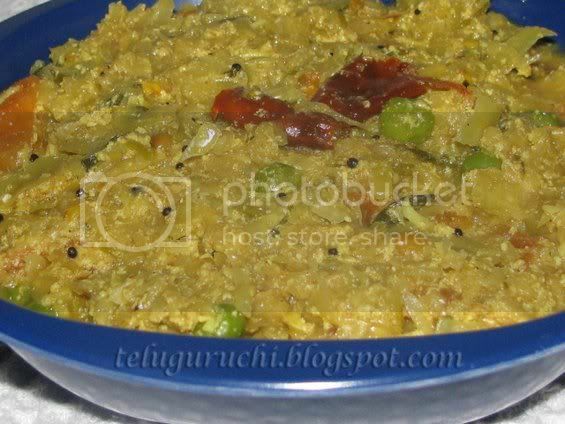 I usually add yogurt to certain vegetables like Snake Gourd and Eggplant to make perugu pachadi. I wanted to see how it will taste with cabbage, but came out so good. We enjoyed the taste to the full. Heat oil in a pan and add mustard seeds. When they splutter, add cumin seeds + Bengal Gram + Black Gram + red chili and fry for some time until the dals turn golden brown in color. 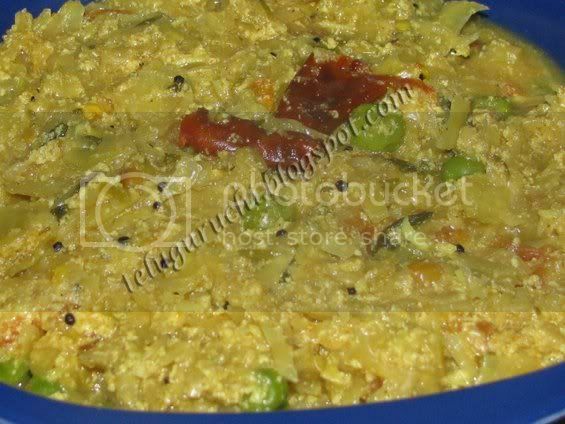 To this, add onion + tomato + green chilies + cabbage + green peas + turmeric and stir well. Pour little water (approx. ¼ cup) into the pan, cover and let all the veggies cook for some time. When all the water gets absorbed and cabbage becomes tender and lost its raw smell, remove the cover and add yogurt and mix well. Keep the flame on low at this time and leave the pan for some time until the vegetables absorb the yogurt well. Add salt to taste. Finally add cilantro, stir well and turn off the flame. 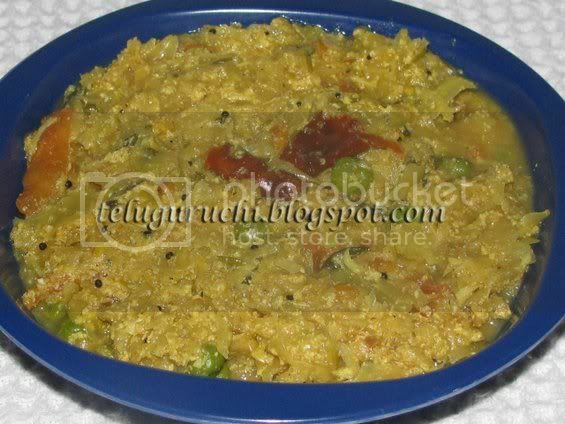 Transfer the gravy to a serving bowl and enjoy with rice or chapathis. Quite an excellent combo...different from usual curries! WOw i have neve rhad cabbzge like this, looks yumm. Cabbage with curd love the idea of the taste blending ...mild flavouring tastes great. good one. Crunchy cabbage must make for a nice pachadi.... good idea. nice recipe with yogurt..sounds delicious ..
Wow looks delicious. Not tried this combination. bookmarked. This is one of my mom's dishes I really miss...looks awesome. This is so new oh I wish I could taste some now!!! gotta try this shortly!!! i always make only simple cabbage curry. this one sounds good for a change. This is new to me too usha.. have cabbage should try out imm. and Photos are so good. Wow this looks so delicious n tempting! Love the addition of yoghurt. Cabbage n yoghurt sounds like a yummy combo! never tried cabbage in yogurt, sounds interesting. Very different & sounds interesting. sure to try. i prepare cabbage in yogurt sometimes, but addition of onion & tomato is something new to me, shall try it soon..
never tried this way of making cabbage pachadi. New recipe to me and looks so yumm! Cabbage in yogurt....thats new to me....but love the combo, must be very delicious. This is a new combo for me... Sounds delicious! Quiet new, i never added yogurt with veggie! Like everybody here I too have never knew we can cook cabbage like this! ! Thanks for this lovely recipe Uma! yes, i've never tried cabbage and yogurt together either! exclude the yogurt and we make something thats similar to a kari. this looks nice! Interesting recipe. Looks delicious and colorful. Thanks for the new cabbage dish. Sounds intresting uma..Will try for sure looking yumm..
Hey Uma..never thot of even adding yogurt to veggies...this looks neat and interesting.Thanks for sharing. Another of your innovative recipes, Uma! I love the potlakai and aratikai perugu pachadis.